HomeArtistsMr. BrainwashMr. 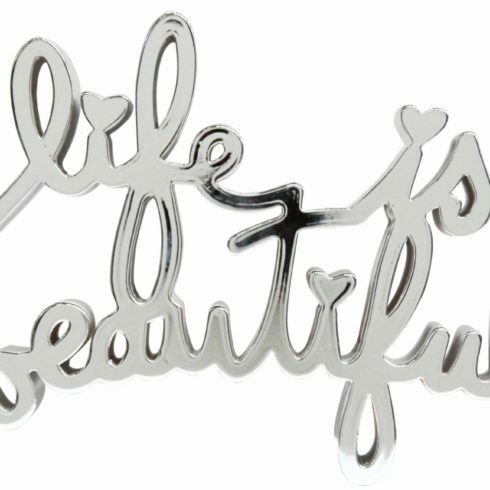 Brainwash – I Love You! 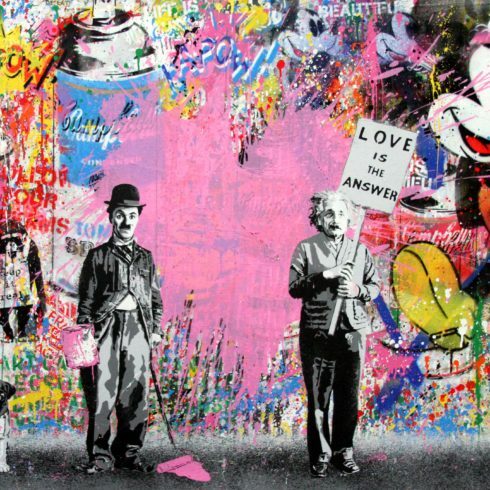 Mr. Brainwash, I Love You! is a mixed media on paper with spray paint and fragile stickers. A one-of-a-kind original artwork with Mr. Brainwash’s special signature on verso with thumbprint and dollar bill sequence. This mixed media piece I Love You! comes with official Mr. Brainwash certificate of authenticity with half dollar bill. 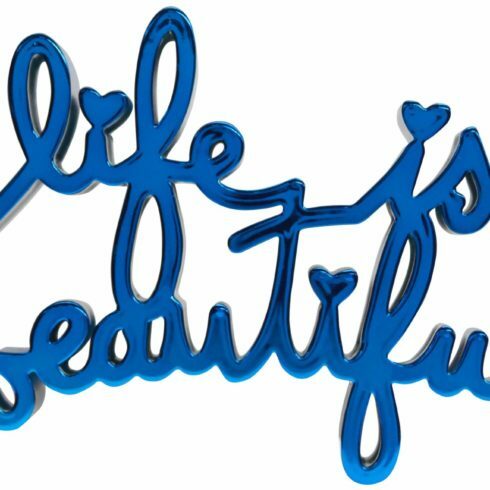 Mr. Brainwash (MBW) is the pseudonym for the graffiti street artist Thierry Guetta. Mr. Brainwash was born in France in 1966. 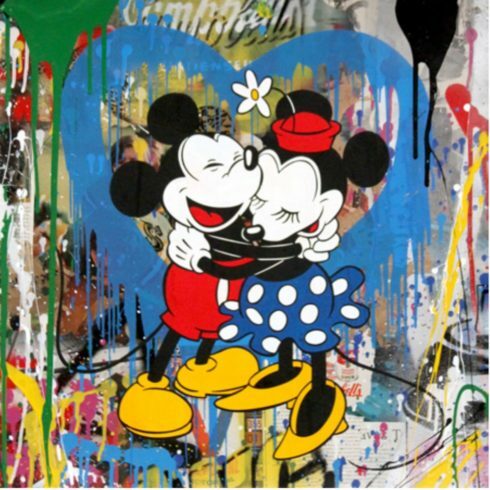 Rising to prominence due to a heavily hyped exhibition and a Banksy-directed documentary entitled, “Exit Through the Gift Shop,” the French artist Mr. Brainwash was once a clothing store owner named Thierry Guetta. He came to the United States with his family years before he would become one of contemporary art’s largest and most confusing personalities. Mr. Brainwash is a French street artist and videographer known for his large-scale installations and prints of celebrities like Madonna, Kate Moss, and Marilyn Monroe. His practice of subverting cultural iconography and appropriation borrows from Andy Warhol, Keith Haring, and Bansky. 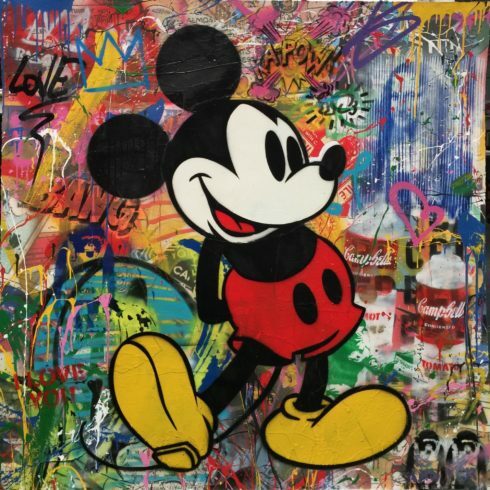 Fellow street artist Alec Monopoly has said that he considers Mr. Brainwash a mentor. He is perhaps best known for his role in Banksy’s documentary Exit Through the Gift Shop (2010), which features Mr. Brainwash’s rise to success in the street art scene. “Banksy captured me becoming an artist,” Mr. Brainwash has said. “In the end, I became his biggest work of art.” Born Thierry Guetta on November 11, 1966 in Garges-lès-Gonesse, France, he moved to Los Angeles when he was 15, where he attended high school before dropping out. The artist later ran a successful vintage clothing store in the city. His interest in street art was spurred by a visit to France in 1999, where he learned that his cousin was the famed graffiti artist Space Invader. Having developed a knack for filming, Mr. Brainwash started to record the nightly escapades of Invader and other street artists, such as Shepard Fairey. In 2013, he was included in the exhibition “Art Wars” at Saatchi Gallery in London. The artist currently lives and works in Los Angeles, CA. Mr. Brainwash (MBW) is the pseudonym for the graffiti street artist Thierry Guetta. Mr. Brainwash was born in France in 1966.Rising to prominence due to a heavily hyped exhibition and a Banksy-directed documentary entitled, “Exit Through the Gift Shop,” the French artist Mr. Brainwash was once a clothing store owner named Thierry Guetta. He came to the United States with his family years before he would become one of contemporary art’s largest and most confusing personalities. 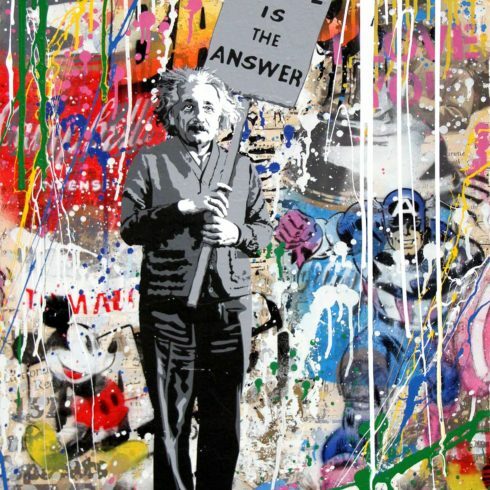 Mr. Brainwash I Love You!